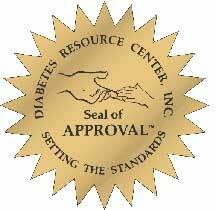 The Diabetes Resource Center: What Does Its "Seal of Approval" Mean? What Does Its "Seal of Approval" Mean? What does it mean if a product is awarded the Diabetes Resource Center's Seal of Approval as "a beneficial food acceptable for diabetic consumption"? This question arose when I found such a statement in connection with two products sold on the Web site of Gary Null. Searching with Google, I found about 50 other sites that offered a total of about 15 other products that had received the same award. I then searched for "Diabetes Resource Center" and found least three of them, but the relevant one turned out to be the Diabetes Resource Center, Inc., at 175 5th Street in Winter Haven, Florida. According to the Florida Secretary of State's records, this entity was registered on 3/27/97 and underwent "administrative dissolution" on 10/16/98 . The "registered agent" was Sandy D. Corlett, who is identified on many Web sites as the Center's president. The database also lists a for-profit entity called DRC Publications, Inc., which Corlett registered on 8/14/95 and reported as dissolved on the same date as the Center. God has blessed me with knowledge and experience that has led me to bridge the gap between the health care professionals, food manufacturers, and diabetics. Diabetes, Cancer, and other diseases, do not have to be a death sentence, nor do they have to rob you of your life, health and hope. It is a matter of choice beginning with your mindset and your nutrition. Again, diabetes can be treated, managed, and yes, prevented! My role has been and always will be education. As a diabetic of over 24 years, I have been blind, lost the use of my legs, been in numerous comas, have had congestive heart failure, kidney failure, and serious digestive disorders. By the grace of God, I have been healed! I have a reason for my hope and joy! As long as I have breath, I will teach others that this does not have to happen to them and that they have a choice in everything they do . Green foods provide numerous beneficial nutrients that are missing from other foods including: 1) chlorophyll, which helps to detoxify and oxygenate the body. 2) enzymes which are responsible for virtually every chemical reaction at the cellular level, and 3) trace minerals which are typically missing from our foods due to the sad state of mineral depleted soils around the world. In fact, trace mineral deficiencies are thought to contribute to many diseases in the world today. 4) Green foods are also a rich source of vegetable proteins. These lightweight proteins enhance the immune system, increase reproductive functions and serve as the building blocks for lean connective tissue. Strong connective tissues increase the strength of our skeletal and muscular systems, and make us less susceptible to the stresses that life puts on our bodies. 5) Lastly, green foods help to alkalize, or neutralize acids and thus help to restore the body’s natural pH balance. Green foods are essential for a healthy digestion. . . .
Nearly every sentence in the above passage is incorrect or misleading. Chlorophyll is useful to plants but provides no benefit to the human body . Enzymes drive cellular actions, eating plant enzymes doesn't influence body metabolism. People who eat sensible are not at risk for trace minerals. The proteins in plans have no special ability to enhance immune function. Foods are not needed to "neutralize acids." Unless people are seriously ill, their body will keep itself in pH balance. And green foods are not necessary for healthy digestion. Florida Department of State, Division of Corporations database, accessed Feb 4, 2005. Corlett SD. Are you…hungry? Tired? Overweight? Stressed? Health Crusader Web site, accessed Feb 4, 2005. Lowell JA. Amazing claims for chlorophyll. Nutrition Forum 4:54-55, 1987. Peri-Gum Mouthwash Concentrate, Peri-Gum Web site, accessed 2/4/05. This article was posted on February 4, 2005.